The Spectrafuge 6C has been designed for quick production of PPP (platelet poor plasma) and PRP (platelet rich plasma) as well as other applications in the clinical or research laboratory. The included 6 place rotor is capable of running round or conical bottom 15ml or 10ml tubes. Adapters for smaller tube sizes are available separately. The control panel of the centrifuge features easy turn knobs and large digital displays for time and speed. Time can be set as low as 30 seconds and to the "On" position for a continuous run. 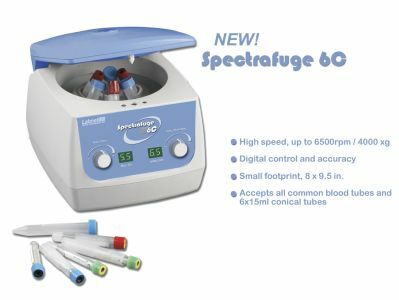 The Spectrafuge 6C is the smallest centrifuge in its class. The 8x9 inch footprint makes it ideal for almost any laboratory and it can easily be transported from lab to lab.